London Met’s Freshers’ activity starts on Monday 26 September. There are two weeks of amazing events and entertainment, followed by a huge Freshers’ closing party on Friday 14 October. Freshers’ Fairs are in Aldgate campus on Tuesday 4 October, and in Holloway campus on Thursday 6 October. All the most up to date info will be on our facebook and twitter, say hello and keep in touch! Follow this link for the first week of daytime events, and follow this link for the first week of evening events. Every day this week we will have movies on the large screen in The Back Room, huge board games and pool, all for free! How much? Free entry for everyone! Create your own cocktail by choosing your cocktail (or mocktail) ingredients, we make it up for you, and you give it any name you want! Prices are £4 per cocktail or 2 for £7. The bar staffs’ favourite cocktail name wins a prize! How much? Entry to the venue is free for everyone! As well as free games all day in The Rocket, we will be holding a paper plane competition. Come down and show us your personal best paper airplane! We’ll be running regular competitions and the maker of the plane that flies the furthest wins a free lunch and a pint! Bring your smartest mates (or if you can’t trust them, come on your own!) for our pub quiz with a difference. We will be incorporating all of your favourite TV quiz shows into this exciting new quiz night! Expect The Weakest Link, Who Wants To Be A Millionaire, University Challenge and more! Cash prize for the winning team, bar tab for the runner up! How much? Entry for the quiz is £1 per person, but entry to the venue is free for everyone! Feeling stressed? Or just fancy winning some free sweets? Come and have a go at breaking our Llama Pinatas. What? GOODBYE SUMMER, HELLO UNI! It’s the FIRST BIG PARTY of Freshers, and we’re saying goodbye to Summer with a sunny Beach Party. Come in your finest summer attire, and expect a free BBQ, tropical courtyard, bucket cocktails and the best summer tunes all night. We’re even throwing in some fire performers! How much? From 9pm, price of entry will be £3 MetCard, £4 Student, £5 Guest or FREE with Freshers Wristband. Price includes FREE BBQ! Come to LMU Circus School, where clowning around is encouraged, and you can graduate in plate spinning! Fancy learning how to juggle, tightrope walk, spin plates, unicycle or walk on stilts? Today is the day, with our circus skills workshop. The Student Union will be holding a speed meet in the Rocket bar from 6pm-8pm, then we will be hosting a fantastically glamorous karaoke night for you to sing your heart out. Free drink for everyone that sings! Then when you’ve all finished singing, we’ll have a Disco DJ and dancing until late! How much? From 8pm, price of entry will be £1 MetCard, £2 Student, £3 Guest or FREE entry with Freshers Wristband. Bring your mates and show us your finest set (up to 25mins maximum). Our judges will choose 1 DJ to play a 2 hour set at one of our future nights at The Rocket, as well as winning a bar tab and pair of amazing Sennheiser HD25 DJ headphones! All genres accepted. We will be setting up a dance floor and lights for anyone who fancies coming down for anyone who can’t DJ, but fancies a daytime party! Sign up by emailing entertainment@londonmet.ac.uk and send us some of your mixes, we will be in touch if you’re successful! Where? The Rocket Complex, 1pm-5pm. Winner announced at 5.30pm. We’ll be having a pre-party from 5pm-8pm with £2.50 spirit and mixers and £2 pints and DJs. We will then be hosting a night filled with live music from 8pm until 11.30pm, then hours of the best indie, electro, dance and classics. How much? From 8pm, the price of entry will be £3 MetCard, £4 Student, £5 Guest or FREE with Freshers Wristband! Follow this link for the second week of daytime events, and follow this link for the second week of evening events. Welcome back drinks with 2-4-1 cocktails, games and all the best old school anthems. Aldgate Hub Freshers Fair will be taking place from 11am-3pm in The Wash Houses, Calcutta House. Freshers Fair is your chance to be given more free stuff than you carry, sign up to all societies London Met has to offer, and generally get to know about uni and the surrounding area. All new and returning students are welcome! In The Rocket, We’ll be providing free cakes (and maybe even a free cup of tea or two) as well as loads of icing and cake decorations for you to make your own cake, we’ll even let you eat it too. Get on stage from 8pm and show us your talent, London Met! it can be anything from singing, dancing, a dog show or you just being able to make your eyebrows dance. Sign up by emailing entertainment@londonmet.ac.uk explaining your talent, and sending and photos or videos of you doing your talent would be great! We’ll also host a pre party from 5pm with £2.50 spirit and mixers and £2 pints and DJs! Dig out your old P.E kit and come and join us for an old fashioned fun filled sports day. We will have loads of races including the egg and spoon, 3 legged, wheel barrow and even a relay throughout the uni. The winners will get prizes and medals, but remember, it’s all about the taking part. After a fun day filled sports day, we will be having a huge sports themed party in the evening. There will be free beer pong, red cups, fun sports games on stage and all the best student and chart tunes! Come in your favourite sporting gear, or if you’re not a sports fan, come in your finest geek attire. How much? From 9pm, price of entry will be £3 MetCard, £4 Student, £5 Guest or FREE with Freshers Wristband. Price includes free beer pong until 10pm. Freshers Fair is your chance to be given more free stuff than you carry, sign up to any and all societies London Met has to offer, and generally get to know about uni and the surrounding area. All new and returning students are welcome, but get there early in case you miss out on the free pizza! We’re going to have some HUGE (and some not so huge) prizes to give away, anything from bar tabs, free entry to events, surprise prizes and booby prizes. We’ll be playing loads of different games from 7.30pm-10.30pm, then DJs and deals on the bar until 2am! How much? From 7.30pm, price of entry will be £1 MetCard, £2 Student, £3 Guest or FREE entry with Freshers Wristband. Price includes unlimited Disco Bingo play! Free use of our giant board games, pool tables and movies on the large screen in the back room! From 7pm at The Rocket, we will have Urban Lounge, with 2-4-1 cocktails and £2.50 spirit and mixers until 9pm, while playing you all the best Slow Jams and RnB. From 9pm we will be livening things up with all the best hip hop, bashment, grime, RnB and soca all the way through until 2am. How much? From 9pm, price of entry will be £3 MetCard, £4 Student, £5 Guest or FREE with Freshers Wristband! 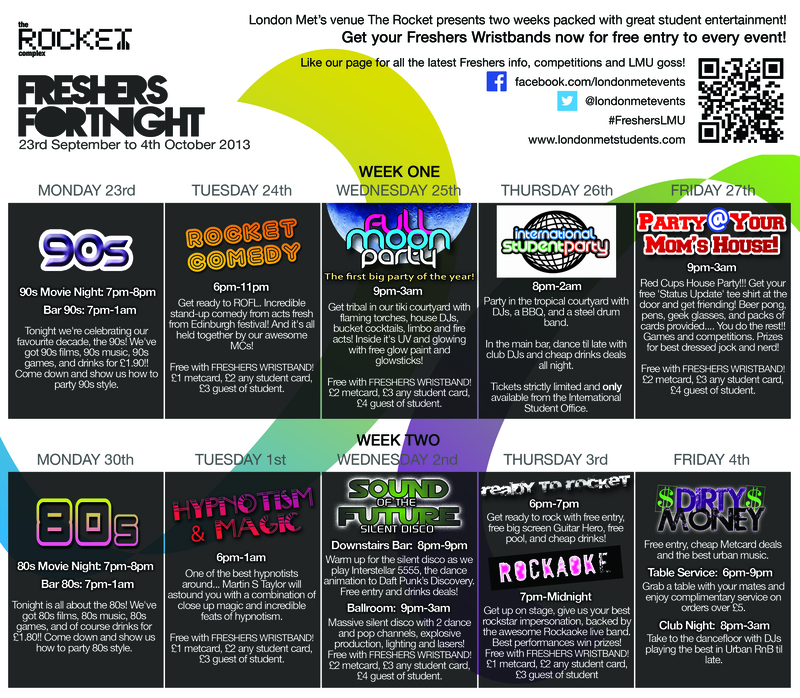 Freshers Welcome starts Monday 22nd Sept at The Rocket! We’ve been getting fresh all summer sorting out a great welcome package of events for all our new and returning students. LMU Freshers 2014 starts 22nd Sept! Our top pick is the free morning coffee from The Rocket on Monday, Tuesday and Wednesday… get involved! There’s something for everyone with food, drink, games, parties, comedy and even magic!! It’s a great opportunity to get to know other students from all round London and to explore your uni! Our top tips are the Monday movies with free popcorn and the Full Moon Party on Wednesday 24th Sept with fire performers and free BBQ! The week after, Party @ Your Moms House on Wed 1st Oct for real freshers partying, and the incredible hypnosis show on Thursday 2nd Oct! Every night will be an amazing time so come to as many as possible! Our top tips for getting the most out of Freshers fortnight!! It’s all very full on for Freshers as soon as you get to London so here are a few pointers to get the most out of your initial weeks at LMU! Freshers can be full on so here are our top tips! 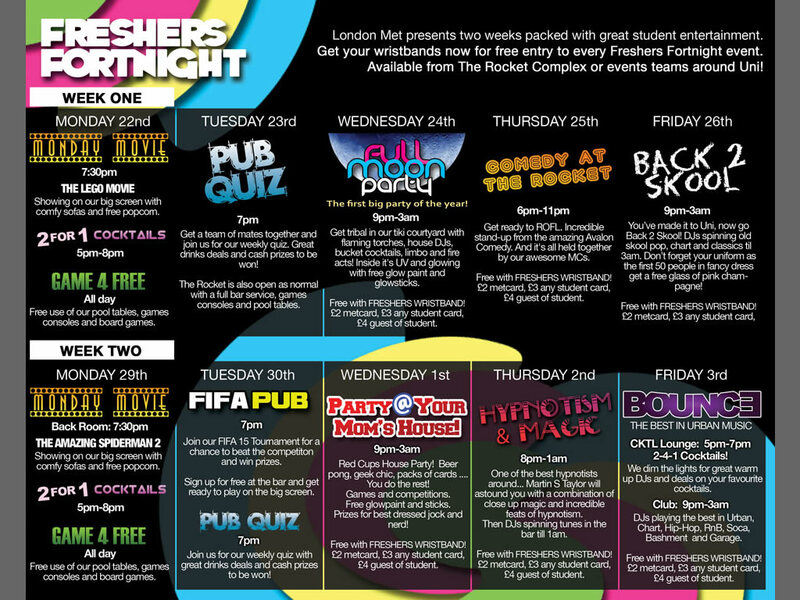 Make sure to get your LMU Freshers Wristband as soon as you get to uni so you can get to all 2 weeks of the events for free. We will have our Freshers events team out around uni that you can pick them up from, otherwise you can get one from The Rocket Complex and we will also be hanging around all the enrolment sessions giving out lots of info too! Make sure to get a ‘Metcard’ when you get to uni, which gives you great discounts around campus, especially on food, drink, merch and event entry! Our top tip is to use it in The Rocket where you can get the cheapest and best breakfast, brunch and lunch – Mon to Fri, great deals on drinks and event entry. You can also use it in the cafes around campus, and the book shop! You can get your Metcard from our events team who will happily print it for you while you wait, either at the Faculty Welcome Events, Freshers Fairs or The Rocket venue. Freshers Fair – for everything you need! There are two Freshers Fairs, in Holloway and Aldgate Hubs. They are held in the Calcutta Basement Met Lounge (in Aldgate Hub) on Tuesday 30th Sept, and on Thursday 2nd October at the Holloway Hub Sports Hall. They have everything from info on all the great societies and sports teams you can join, to DJs and slices of free pizza… we strongly recommend you don’t miss this one off event at either campus! Top tip: get your NUS Extra card and meet the Student Union. And get your Metcard! Timings are 11am – 4pm for both events. Freshers Welcome Party 2014 is on Friday 10th October, 8pm – 2am! Freshers Welcome Party – just for you! The Freshers Welcome Party is on Friday 10th October and is the last and biggest event of Freshers Fortnight! It’s a huge party with something for everyone, and ALWAYS sells out, so make sure to get your tickets nice and early. Please note this is the only event not included in the Freshers Wristband free entry. There will be a champagne reception, London Taxi Photo Booth, free BBQ, live band and DJs, and especially important, you get 2 free drinks with your ticket!!! Tickets are £5 student advance (£6 on the door), £7 guest advance (£8 on the door). Tickets available online soon, find out more on our FB page. If you want all the latest goss and info on what’s going on socially around uni, you have to get involved with our facebook and twitter – let us know you’re here and get chatting, we’re a friendly bunch, very worldly wise about everything to do with #Londonmet, and would love to meet you! Building up to LMU Freshers Fortnight 2014! Freshers Fortnight 2014 kicks off at LMU on Monday 22nd September! There will be club nights, gigs, comedy, cabaret, vintage fair, taster activity sessions, competitions, give aways and more! Make sure to pick up a ‘Metcard’ when you get to uni, which gives you great discounts around campus, especially on food, drink, merch and event entry! Our top tip is to use it in The Rocket where you can get the cheapest and best breakfast, brunch and lunch – Mon to Fri! The Freshers Fair is held on Thursday 2nd October at the Holloway Hub Sports Hall. Everything from info on all the great societies and sports teams you can join, to DJs and free slices of free pizza… we strongly recommend you don’t miss this one off event! The Freshers Welcome Party is on Friday 10th October and is the last and biggest event of Freshers Fortnight! It’s a huge party with something for everyone, and ALWAYS sells out, so make sure to get your tickets nice and early. Find out more soon on our FB page. 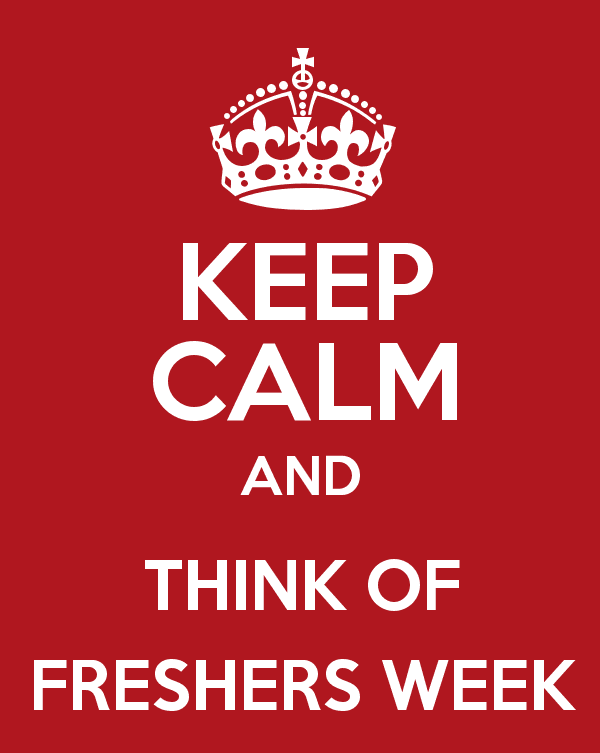 Fresher’s Fortnight is almost upon us…. are you ready?? Oh do we have some special treats in store for you! The festivities kick off at The Rocket Complex on Monday 23rd September, and we have 2 weeks of free entertainment for all Freshers, until Friday 4th October. From live music and club nights, to hypnotists and comedy, there is guaranteed to be something you will love… It’s a great time to get involved, make new friends, and best of all every event is free entry for you lucky Freshers, so you can make sure your money gets spent wisely (or at the bar!!). All you need to get in to the events for free is your Freshers Wristband. You can get this from the Rocket Complex staff who will be at enrolment all week, sorting out your metcards and giving you wristbands!! Make sure to get down to the LMU Freshers Fairs. We have one at each campus and they are a great way to stock up on freebies as well as join societies, get to know your SU, and see what else is going on around campus and in London. Stay in touch this #FreshersLMU…. For all the latest news on Freshers events, competitions and giveaways, and general LMU goss, make sure to like our FB page. For info on events around uni and tickets, as well as the gym, student shop, Metcard and more check out LondonMetStudents.com. We can’t wait to see you, make sure to say hi to us on FB and twitaaar! We just can’t believe that it’s already nearly September… just Notting Hill Carnival and Reading Festival left before we start thinking about studying again!! Freshers planning is nearly complete… with parties, activities and fun opportunities for our London Met students to get stuck in, make new friends and see what uni life has to offer. As I write this thousands of A level students are jumping happily in the air, results in hand, to the joy of local press photographers eager for a snap of our future students. Hope you get some good shots guys. 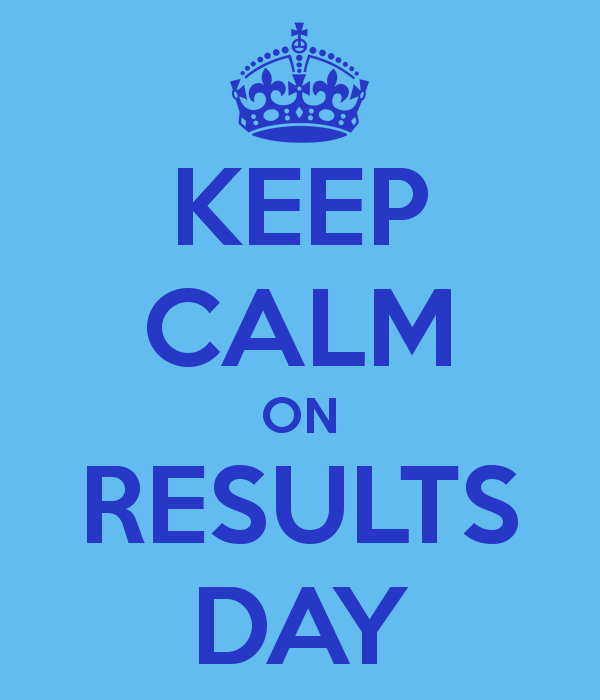 So very well done to all who got their grades. We’ll be seeing you soon, 23rd September is when Freshers starts! For those who didn’t, there are loads of options. The uni might accept you anyway if the grades are close enough, so give them a ring. Otherwise there is the clearing system… clearing doesn’t need to be daunting, and it can make you realise there are other courses you’d love to do that maybe you didn’t consider before. I have mates who’s enviable careers started out on a decision they made in clearing. 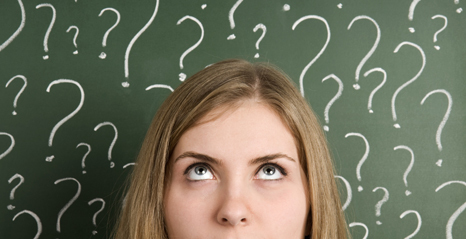 There are lots of Clearing Planners and online guides so get involved and get that place. LMU has some great clearing places on different courses, so make sure to give us a ring on 08000324441! Freshers starts 23rd Sept at London Met! for all the latest event info and general tips and tricks for student living in London!